Do you wish to revive the good look of your window surfaces fast and with ease?Are you searching for techniques of efficient window washing? If the answer is positive, you have come to the right spot! With the professionals of window cleaning in Spitalfields, you will positively bring back the sun rays into your property. You will enjoy spotless windows as well as superbly clean framework and sills. You will be able to use your recently-acquired free time as you want to while we clean the windows of your place. You will not only stay away from this monotonous and burdensome work – our services will also present you some alluring benefits. You can depend on the abilities and competence of the experts for cleaning all types of windows. The glass surfaces in our proficiency are: single or double windows, bay ones and sash windows. Of course, if you have French doors, garden windows, greenhouse or skylights, we will make them nicely-looking, too. With our progressive ways of working and latest machinery, we can cope with all types of window cleaning, even with hard-to-reach glass panes. We provide first class window cleaning by using advanced techniques. We provide gleaming and absolutely clean look for your glass surfaces, skylights and conservatories with water-fed cleaning system and high pressure cleaning. The poles we use are connected to water supply devices in our vans, thus eliminating the risk of damage to the exterior of your home or workplace. In addition, we use totally safe rope access techniques to clean glasses on high-rise buildings. You can benefit from these methods instantly – call us on 020 3746 3113! The specialists of commercial window cleaning will provide you with top-notch service for your work environment. We can reach as high as the fourth floor of your building with our water-fed pole system. If your building is taller, we will perform the washing with the help of our rope access equipment, designed specially for hard-to-reach glass panes. 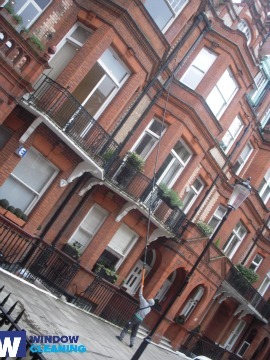 All in all, you can count on us for thorough window cleaning of all commercial property types - from small shops to the highest skyscrapers in London. With our quick and efficient residential window cleaning in Spitalfields, you will enhance the look of your home at once. We use purified water for inside/outside cleaning of your windows. We make this possible by clean from the ground with water-fed extension pole system, which is safe both for your dwelling and the cleaners. Discover more – contact us on 020 3746 3113 or complete our online booking form. Otherwise, use our chat facility. Our representatives are active 24/7 – you will get answers to your questions. You can be one of our content customers now!